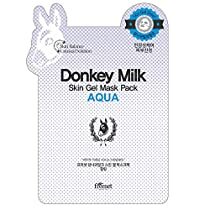 Donkey milk, is the newest Korean beauty secret “it” item. Contains an abundant amounts of Vitamins A, B, D, C and E and bio-polymers to moisturize and slow down the aging process. Intensely hydrate your skin with this Donkey Milk Aqua Skin Gel Mask and leave your skin looking bright, radiant, and youthful.